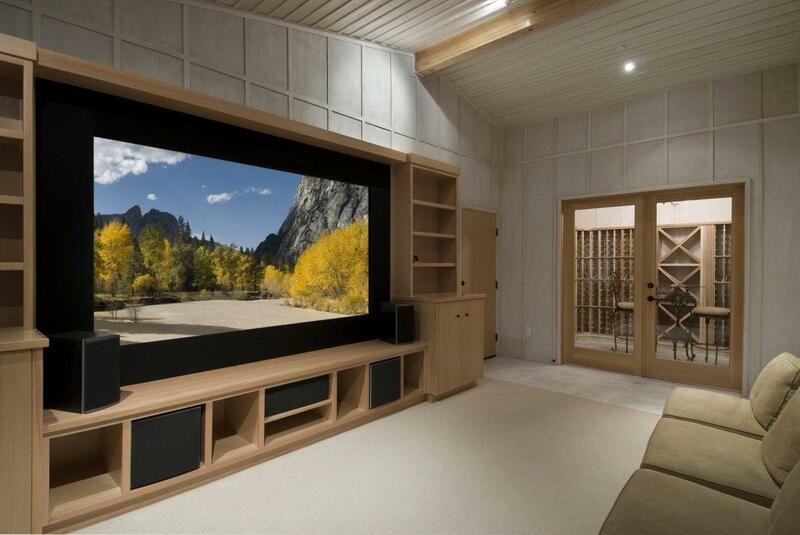 No matter the size of your home, there’s always one dream we all seem to share: the ultimate home theater setup! It’s undeniable—going to the movies is a favorite pastime of ours. Leaving the real world for a few hours, escaping to another dimension. The spacious theater carrying otherworldly travelers, providing a vessel for their journey. The mountainous screen ensuring all get a window seat to unparalleled visuals. The immersive surround sound placing everyone smack dab in the middle of it all. So it’s only natural wanting that full-blown theater experience in your own home. Especially with more affordable technology now, home theaters are not only for the rich and famous anymore. But where to begin when designing a home theater setup? Fret not, young padawan. Make your dream home theater reality, we shall. Ok, who swapped the shower curtains in here? So you know where you want to set up your home theater. Perhaps it’s in the family room or spare bedroom or your palace of a basement decked out with plush seats and a vintage popcorn machine. 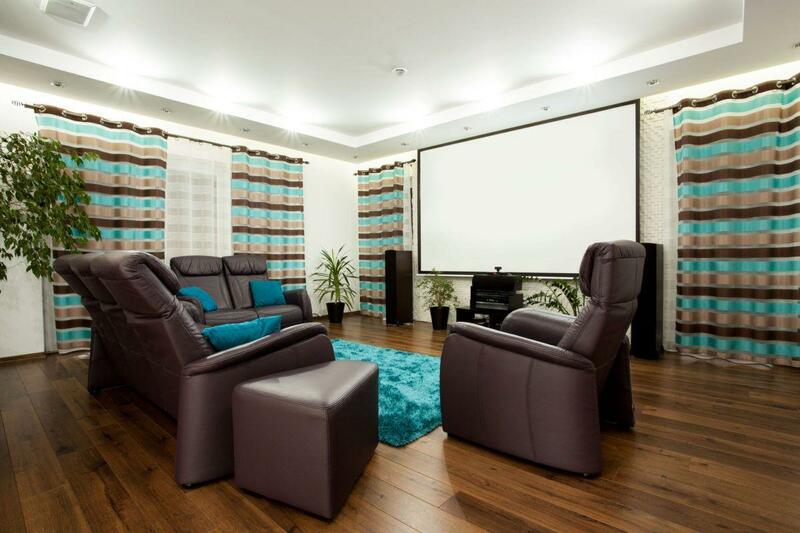 While these places may be comfortable, there are many other factors to keep in mind when selecting the ideal location for your home theater setup. • Room format. Beware or be square. Square rooms have a tendency to manufacture weird harmonic distortions. Rectangular rooms work better. Place your TV and main speakers along one of the short walls for best sound projection. • Windows. The window seat may be preferred in an airplane, but they certainly are not in home theaters. These hard surfaces reflect audio distortion and let in light that can create reflections on your TV. Curtains or shades help, although they can be cumbersome closing every time you’re in your home theater. • Walls. To the windows, to the walls. 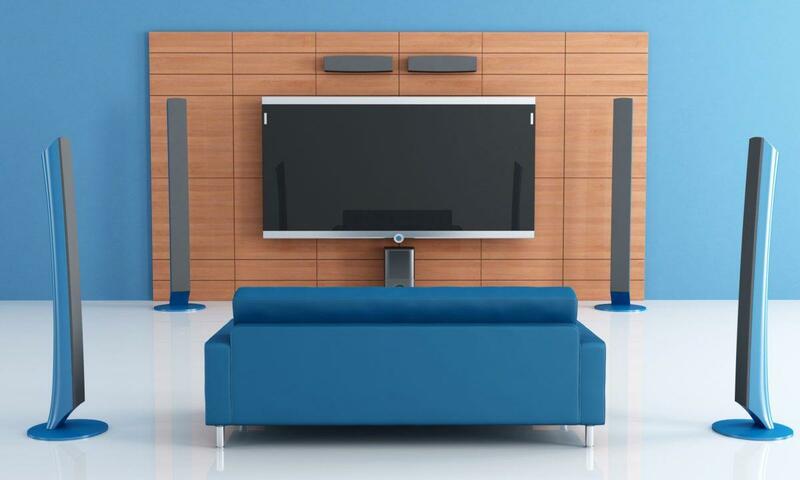 You’ll want to try and keep the sound in your home theater isolated from other parts of your home. Regular drywall is a competent surface. Try adding furniture or drapes to break up large surfaces. Don’t hang framed pictures with glass as they are too reflective of light and sound. Concrete walls are bad. 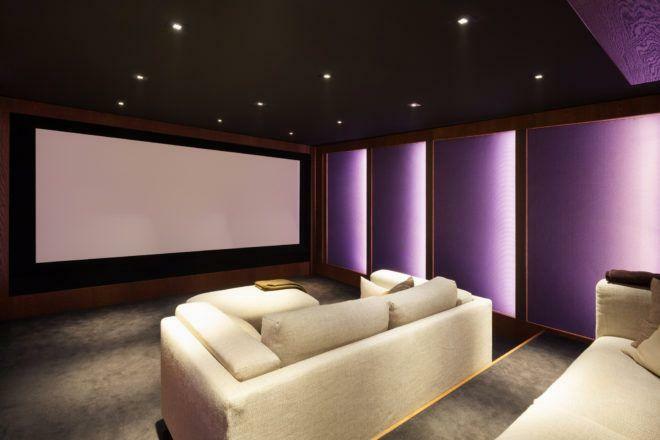 If your home theater setup is in the basement with concrete walls, consider installing drywall and studs. Acoustic wall panels are another option. They help to absorb sound and modulate high and low frequencies to prevent echoes. • Floors. Cutting a rug on the dance floor. Good. Cutting a rug in your home theater room. Not so much. You’ll want to keep the carpeting in there in good condition. Wall-to-wall carpet, along with cushion pads underneath, absorbs sound and makes for a cozy surface to sit or lie on. • Room color. The darker your walls, the better. Bright-colored walls reflect light and can become distracting. Also, shy away from semi-gloss and gloss paints. Go for eggshell, flat, or matte sheens to fight reflections. Neutral browns, olive, and tans are good colors. Stronger colors like blue or red gives a weird cast to ambient light and can affect the colors you see on your TV. Speakers double as an invisible fence forcefield. Some would say having a good surround sound system is more vital than having a fancy big screen TV. Hard to argue when it is the sound that puts you right in the middle of the movie. When a plane flies by and the rumbling moves from one side of the room to the other. Or when there are explosions and gunfire going off, you’ll feel the action all around you as if you were caught in a crossfire. That is what really brings the movie to life. • Speaker position. Home theaters often feature 5.1 surround sound: five full-range speakers and a low-range subwoofer. Three speakers and the subwoofer will be placed in the front of the room, near your TV. The other two speakers slightly behind your viewing area on either side. Keep them 20 inches from the walls, at least, to avoid sound being reflected off walls or other surfaces. Every room is unique, however, so you’ll want to experiment with different speaker placements. • Speaker distance. Place your viewing position the same distance from your speakers as the speakers are from each other. Most surround sound systems have volume controls for each speaker and even allow to adjust the timing, or delay. This will time the sound projection so sound from all speakers arrives to your ears at the same instant. Beneficial for setups in large rooms with the speakers at different distances. • Center of attention. The speaker that is most vital is perhaps the front center speaker. It has the responsibility of projecting audio directly from the TV, most importantly the dialogue. Adjust your front center speaker so all dialogue sounds like it’s coming right from your TV, and not from either side of the walls. • Bring the boom. Your subwoofer should be placed in the front, but on which side? The low bass ranges from a subwoofer will spread throughout the room, so you don’t need to worry about angle as you would with the other speakers. Placing the subwoofer in a corner helps distribute the sound evenly, but you’ll want to test out different locations of your room before finalizing its resting spot. Only after half an hour did they realize they were watching a painting. The big bad high-definition TV. The king of the hill of any home theater setup. You may think a bigger TV leads to a better viewing experience, but bigger is not always better. Not when your TV is so large you’re swinging your head side to side trying to enjoy a movie. You’re not watching a tennis match after all! You’ll want a balance of ideal TV size and viewing angle. • Viewing distance. Ideal viewing distance differs a bit whether your TV is 1080p or 4K. Since 4K TVs have extra detail, you can sit closer to them. The general rule is to sit 1.5 to 2.5 times the screen size of a 1080p TV and 1 to 1.5 times the screen size of a 4K TV. So the viewing distance for a 1080p 60-inch TV is between 7.5 and 12.5 feet. A 4K 60-inch would be between 5 and 7.5 feet. • Viewing height. Ideal viewing height is having the center of your TV at eye level. It may be tempting to place the TV higher up on the wall, but just like sitting in the front row of a theater, the unnatural viewing angle can get uncomfortable, resulting in a stiff neck. If your TV is placed higher than eye level, tilt your TV downward so it faces your viewing position. Ready to design your dream home theater setup? BZB Express will be happy to help! Give us a buzz at 1.888.660.2962 or email at support@bzbexpress.com. We provide full service for all your audiovisual needs. We’ll help design your entire home theater setup and research the correct products. If you need install assistance, we have great relationships with installers and can recommend one in your area. More of a Do-It-Yourselfer? Browse our entire BZB Express online catalog. Our large inventory allows for countless options and possibilities. Be sure to visit our YouTube channel BZBtv for insightful demos and reviews on the latest AV gear. All we ask is you invite us over for the movie premiere in your new home theater. We’ll bring the popcorn!